Note: The Profile Block requires the active Gutenberg plugin at this time. Before we dig into the code, I think it’s important to look at the overall file structure of our plugin. It will give us a better understanding of the necessary components that make up a block. organic-profile-block.php – Register our plugin and call our block files. includes – Folder for any global block resources. In this case, our fonts. fonts – Folder for Font Awesome font files. 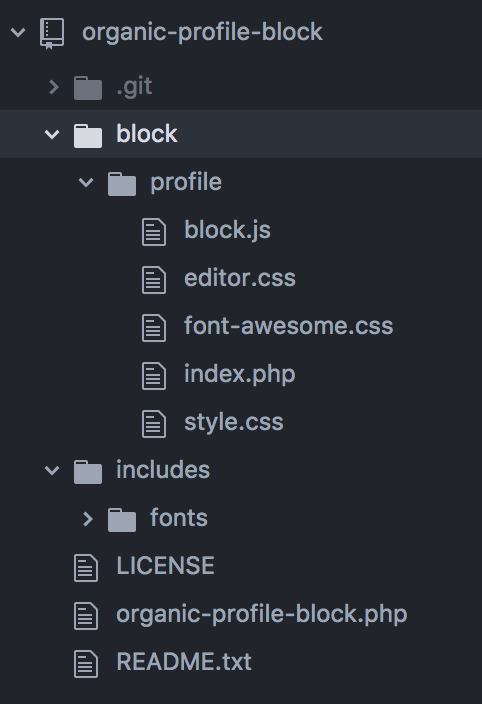 block – Folder for custom blocks. profile – Folder for the profile block. editor.css – The styles for viewing the block within the Gutenberg editor. font-awesome.css – The styles for our Font Awesome icons. index.php – The file for enqueuing the block assets. style.css – The styles for the front-end appearance of the block. We’ll start by registering and enqueuing the scripts and styles for our custom block in the index.php file. This process should be familiar to theme and plugin developers, and it’s the bulk of the PHP we will be working with. Next, we’ll use the register_block_type() function to enqueue the scripts and styles. Here, you will use the unique handles defined in your previously registered scripts and styles. editor_script – Scripts loaded only within the editor. This is where you will enqueue the block.js file. editor_style – Styles loaded only within the editor. script – Scripts loaded both within the editor and the frontend of the site. style – Styles loaded both within the editor and the frontend of the site. Next, we’ll import the components needed for our block. There are many components available. Unfortunately, I haven’t found a library listing all the components with descriptions. So, finding and using the right components has been a process of trial and error. Now that we have registered our custom block, we need to build the interface. The block interface is comprised of 2 parts. The edit function is the interface for the block within the editor. The save function saves the output of the block for the front-end. I’m going to break down the edit function into 4 parts — declaring variables, block controls, inspector controls, and the elements of our block. There you have it! That’s the bulk of creating a custom block for the upcoming Gutenberg editor. Just add styles, and you will have a fully functioning custom block! When I began working with WordPress in 2008, I was ignorant of PHP development and building custom themes. I struggled to find resources on the subject. As a result, I taught myself with the little bits of information I could find. Over time, I honed my skills. I became comfortable and confident with what I learned. The announcement of Gutenberg was somewhat frightening because it disrupted my comfort zone. I knew it would force me to learn new ways of development, and it would force our business to evolve. Any immediate dislike towards the new direction of WordPress was based in fear. However, that’s not a valid reason for disliking Gutenberg. The fact of the matter is that developing for Gutenberg is much more difficult. It introduces new languages and dependencies to the platform. Some developers will evolve, some will flourish, some will resist change, and some will be left behind completely. New businesses will be born, and old businesses will die. I believe the average WordPress user is still very unaware of the changes that are taking place. However, I think Gutenberg will be a very positive change. It’s a major step towards simplifying the platform. It will provide users with considerably more control over their content. Additionally, it will eliminate the need for many shortcodes, custom post types, page templates, and other WordPress relics. Eventually the old admin will fade away, as mentioned in my post about the Future of WordPress. The more I work with blocks, the more potential I see. 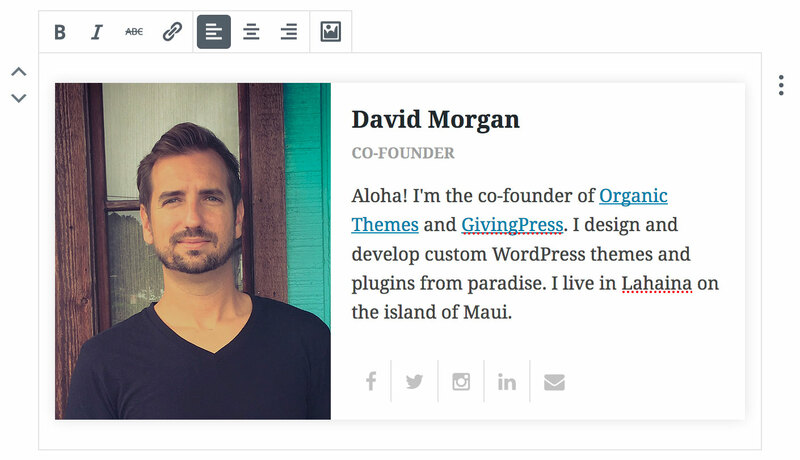 It feels like a rebirth of WordPress is on the verge of taking place. Frankly, it’s needed. I was feeling stagnant in my work as of late. Now, WordPress is new again. WordPress was built by a community of people who just started poking around in the open source software. We bent the platform to meet our needs, and we learned along the way. Gutenberg is forcing us to do that all over again. If you can get over the shock of such a big change, it has the potential to be exciting. Organic Themes is taking Gutenberg seriously. We believe blocks are the future of building pages and websites with WordPress. As a result, we intend to align our products with the upcoming editor. We are excited about the possibilities, and looking forward to a rebirth of our company with the integration of Gutenberg into core. We anticipate our themes becoming a framework for blocks. They will focus on simplicity, with styles and layouts catered to the usage of blocks. Additionally, we have begun development on a suite of custom blocks for Gutenberg that will seamlessly integrate with any theme. Similar to widgets with our Customizer Widgets plugin, blocks will be used to display a variety of content sections on your site. The links below are the resources I found most useful when building a custom block. Additionally, this post from WP Tavern lists several Gutenberg resources. A huge thanks to the developers that have provided these resources! Please feel free to contribute to the Git repo, and offer any constructive criticism in the comments below. Back in October I was in an odd place. I’d been asked to build a website for a local community group and I’m also in the paperwork process of setting up a new charity (if all goes well it launches April 2018). I’d used WordPress for an local events group and I knew that the platform would be best suited to both new projects but Gutenberg arriving within the year really worried me. WordPress is long overdue this change and it’s a change that has too much backing to be stopped but it raised some key questions. Would I need to build these sites and in 6-12 months change everything to suit the new WP Way? Would I need to train, and train again the contributors to the site? Was it worth delaying everything to see where the land would lie in 6 months? All valid questions, even more so when it’s all volunteers times. Then, by accident, by searching for ‘Gutenberg WordPress Themes’ in Google I found a blog post on your site. What made the post different was that it was embracing the new. It was enough. for me, to decide then and there you were getting the sale. Thank you for writing it. The actual purchase came a little later (money is tight for the group and free is hard to combat!) but your teams service has been exceptional. I don’t see how I could have made a better choice. The single reason your company got the sale is because it’s being so open and so forward thinking with regards to Gutenberg. The fact your themes are delightful to work with (no clumsy dashboard extras, all changes are made in the customiser), posts remain easily transferable and your after sales support is second to none are incredible bonuses. Yes I might still have to make changes, including possibly replacing the theme but I am reassured by my experiences that if it is required it will be almost painless. I think your questions and concerns regarding Gutenberg are definitely valid. One of the major strengths of WordPress has always been a focus on backwards compatibility. So, while the editor will change, the old ways of editing will still be available after Gutenberg has been implemented — most likely using the Classic Text block. 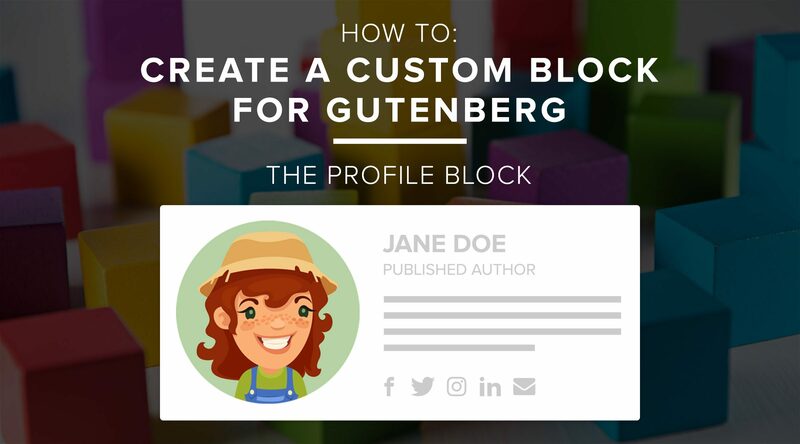 Gutenberg can already convert content added within the classic editor into blocks. It works quite well, although you may experience some slight issues with spacing and styles that may need to be addressed, depending on your theme. However, there shouldn’t be any need to rebuild your sites after the update takes place. From a user perspective, I don’t foresee a big learning curve. If anything, I think Gutenberg is more intuitive than the existing editor. So, any training of volunteers or employees done before the change should not be lost. Granted, training might be easier after the change. Additionally, adding custom input fields and meta boxes to blocks is possible within the InspectorControls element. We have done this with the Profile Block for the social media link fields. Excellent post. Added to my list of Gutenberg resources. As I see from the code there is almost no PHP involved. What would that mean for SEO? It does pose an issue for the large number of WordPress developers that are accustomed to coding in PHP. Personally I’m excited about the direction that Gutenberg is taking WordPress in. My main concern though is how that will affect the many client sites we have already built in older versions of WordPress. I suppose in a way it’s an opportunity. True. The conversion of content to blocks seems to work well, but if you have made customizations to the classic WordPress editor for your clients, then Gutenberg could pose a problem. I imagine new services will arise around supporting the transition to Gutenberg for clients and users. Thanks for sharing you code! The Image-Upload button isn’t there. I had some warning in the console, so I tried to fix the warnings. The warnings are fixed, but the Image-Upload button isn’t there yet. And there aren’t any other warnings or errors in the console. Do you have any idea or solution? I ran into this problem too and could not get the upload button to show up. In my case this was caused by Advanced custom fields. This issue have been resolved so it was fixed by updating the plugin. Hope it helps! Thanks so much for taking the time to put this together. I find practical examples like this much easier to learn from and understand than simply reading through the documentation and it saves a lot of trial-and-error. Thanks for this amazing tutorial. I’ve created themes and plugins in the past, so I thought it was time to learn how to create a block. I installed your plugin, and then I created a new plugin based on your code. It resides in its own directory, and of course it has a unique name as the block type. When I enable my plugin, yours no longer appears in the Blocks panel. It seems that there is some conflict, so that one or the other is recognized by WordPress, but not both. Is there some sort of identified that I am missing in the code? Hundreds of lines of complex code for a picture and some text. Yay, the future of a WordPress developer looks Awesome! Haha, can’t argue with that. Block development isn’t easy, but it is comparable to the amount of PHP code that goes into developing a widget. After updateing to WordPress 5.0 this block is not longer supported by my website. What do I have to change to fix this issue? Thank you a lot for all your efforts! Is this not supported anymore? It’s been a year since this tutorial was written and A LOT has changed. Hi Janet, yes – the Organic Profile Block is still supported. Can you please clarify your concern? You can also submit any support related question for the Profile Block to the proper forum: https://wordpress.org/support/plugin/organic-profile-block/. Thanks! Can you build image block that had feature alignment image and resize image similar image block default. David, thanks for sharing this knowledge and the block resources.